we have the pirate voyage for you! Our ship can carry a maximum of 49 passengers. 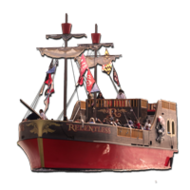 Give your event an unique flair and celebrate in true pirate style. We have hosted a wide range of events including birthday parties for all ages, retirement and anniversary parties, family and class reunions, and yes even weddings! Each adventure will be tailored to your individual needs with entertainment for all of your guests. Urban Pirates is an excellent addition to a night planned in National Harbor celebrating upcoming nuptials. Do you and your co-workers need a day away from the office? Get to know your office mates better on a high-seas adventure. 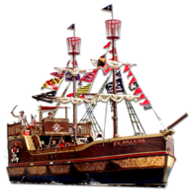 Whether you want to highlight a new product line or give a thank you to your loyal customers Urban Pirates has the most unique party venue in town. On all full boat charters our policy is B.Y.O.G. – Bring Your Own Grog! Stock your cooler with what ever grog will quench your thirst and bring along any grub you would like to eat. Group discounts available for groups of 25 or more on regularly scheduled Adult BYOG Cruises. At Urban Pirates groups are our specialty! We have programs for Camp, Scout, Church, Daycare, and School Trips that include games, songs, team building activities, and entertainment designed for all age groups. Urban Pirates’ interactive story line keeps riders of all ages engaged with songs, games, stories, and activities. Everyone goes home with their choice of glimmering treasure, a prize sure to please! 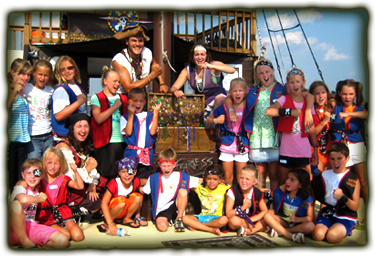 Our crew will lead your group in pirate tales and engaging activities suited to their age. For middle and high school students we also offer group team building challenges and prizes. Bring your pack or troop out on the water for a swashbuckling good time! We have unique, engaging and fun activities for scouts of all ages. Many of our crew members are former scouts and know what it takes to entertain the rowdy masses. 7 days a week, April-October depending on availability. Charters include 30 minutes of boarding activities before sailing. one hour sailings before 5pm. Full Boat Charters can be booked 7 days a week. All Cruises include 30 minutes of boarding activities before sailing. A 50% deposit is due at the time of booking. Call for more information. Visit our Birthday Adventures Page for more party options. Want more than is listed above? We can meet your needs. 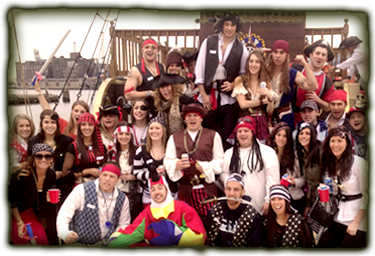 Call us to design the ultimate pirate event!